A bunch of new Wikileaks State Dept. cables about the Middle East have been released in the last few days, and to my surprise several friends have informed me that I appear in at least two. I now feel like a minor historical character. In one 2005 cable I appear in my capacity as one of the editors of the short-lived Cairo Magazine. I'm somewhat surprised that the difficulties that the magazine had with the authorities merited their own cable, but apparently in the context of the Bush administration push for reform in Egypt in 2005, it makes more sense. The offending coverDespite its small circulation, Cairo Magazine tackles controversial issues in a professional manner that meets international standards. Cairo Magazine Managing Editor Issandr El Amrani told PA officer on June 4 that the June 2 edition of the magazine could not be distributed, since the Ministry of Information (MOI) had not granted it permission to do so. El Amrani reported that the MOI appeared to object to the edition's referendum coverage, which included photos of National Democratic Party (NDP) supporters assaulting opposition demonstrators. 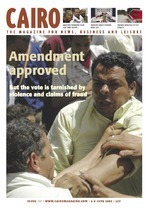 The June 2 edition's cover, entitled "Amendment Approved," carries a photo of two men fighting. The article in question, "The Day the Gloves Came Off," leads with the subheading "The violence of the referendum is a bad omen for the upcoming elections" and blamed NDP supporters for the violence: "According to witnesses and journalists. the responsibility for the violence rested on the people carrying the pro-government banners. NDP counter- demonstrations formed up in front of the Kifaya demonstration and then, once security moved out of the way to let them through, attacked the Kifaya members." The magazine was initially given to the MOI for approval on June 1, but on June 2 an MOI official said it would need to be sent to Information Minister Anas El Fekki for his clearance. No further explanation was offered. When approval to distribute was granted late in the evening on June 5, no explanation for the delay was given. "It seems like it was their way of flexing some muscle with us," El Amrani told PA officer on June 6. I have no recollection of that conversation but those were busy days. If you're interested in the way we dealt with censorship back then, read on. The magazine closed at the end of the year because of repeated similar problems and the pullout of the main funder. The staff did not want to continue the magazine by going into debt, a difficult experience we had at the Cairo Times previously. I've always felt that although Cairo was in many respects marginal in the Egyptian debate, since it was in English, its reporting on the watershed year of 2005 and the fact that it was created at the beginning of an opening and closed at its end was quite telling of the wider picture. Mubarak opened up under US pressure, and then quickly retreated when that pressure faltered. It's an open question whether the 2005 opening bought him time or, on the contrary, bought enough room to create the seeds of what would end up as the January 25 uprising. Probably the latter. The Ambassador and other Embassy officers regularly meet with leading civil society activists and liberal intellectuals such as Saad Eddin Ibrahim, Osama al Ghazali Harb, Tarek Heggy, Hisham Qassem, Ghada Shabandar, Hala Mustafa, and Bahia Al Din Ibrachy. We also meet leading activist bloggers; Issandr El-Amrani (arabist.net) has twice been a guest in the Ambassador's residence. I can confirm: The ambassador's receptions are noted in society for their most exquisite taste that captivate his guests. In fact I did have conversations about US-Egypt relations and Egyptian politics with several ambassadors, as other bloggers have. Can't say it made a big difference, but then neither the Bush nor the Obama administration really ever had a coherent stragegy for democracy promotion in Egypt: they complained about abuses but never wanted to even threaten cutting military aid. The diplomats in Cairo were mostly trapped by the competing agendas and bureaucratic turf wars in Washington, since they had to reconcile the desire to maintain good relations with Egyptian officials and the much-fangled Freedom Agenda policy. By early 2006 the Freedom Agenda was an empty shell but there were still stakeholders in Washington who pretended otherwise, or for whom (like the neocons and pro-Israel congressmen) for whom it was a convenient stick to hit Cairo with when they had problems with its policy towards Gaza. The irony here is that the "activist blogger" in question is not Egyptian — in fact he's an American quite angry with his own government. The list of other people (pretty much all center-right liberals) is also hardly representative of Egyptian civil society. The website is also mentioned here and here in surveys of public reactions to events. It's nice to be appreciated, so do keep on reading, embassy staff. I look forward to reading your work too.